As I was napping today, (“How could you take a nap with 3 kids?” you ask. Well because I am just now getting over strep throat which I’ve had since Monday night and my dear sweet husband has worked from home the whole week so he could take care of me and the kids!!! I know I’m totally spoiled by him!! Thanks babe!) I was awoken by Ella running in my room and screaming “I poopoo’d in the potty mommy! !” Now this is something of a feat because we have been trying for her to poopoo in the potty for the past 6 months (oh the joys of potty training!). I got out of bed and looked at James and asked, “Is it true?! 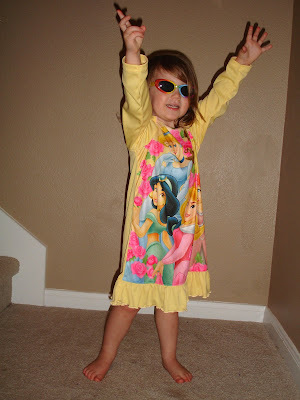 ?” “Yep!” he replied and we both looked lovingly at the Disney princess nightgown…. So what did I learn from all this? If vanity worked now, James and I are in for it big time when they hit puberty! !